Uniroyal Rain Max The summer tyre for vans and people movers. More safety, more efficiency, more comfort. 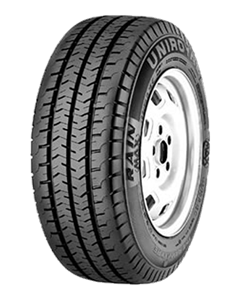 The RainMax is the original Uniroyal wet weather van tyre. A large contact patch coupled with wide drainage grooves mean the RainMax thrives in wet weather conditions. A robust outer shoulder design gives the tyre extra protection against unexpected sidewall contact. Handling is assured thanks to the use of a stiff tread pattern design.